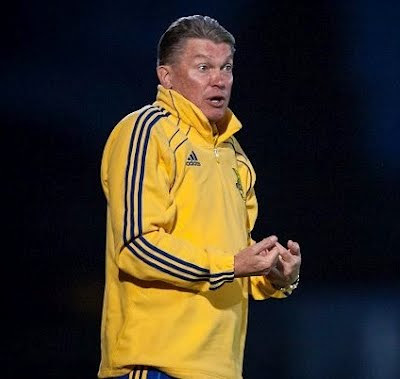 LONDON, England -- Ukraine coach Oleg Blokhin omitted goalkeeper Olexandr Bandura, defender Vitaly Mandzyuk and midfielder Taras Stepanenko in finalising his squad for Euro 2012 on Tuesday. Gamble: Ukraine coach Oleg Blokhin. The trio were dropped following the 4-0 friendly win over Estonia on Monday. Co-hosts Ukraine will now go into the tournament with a shortage of experienced keepers. First-choice Olexandr Shovkovsky sustained a shoulder injury to miss out on the tournament, Andrey Dykan suffered head and facial injuries in a Russian Premier League match and Oleksandr Rybka was suspended for using a banned diuretic. Shakhtar Donetsk goalkeeper Andriy Pyatov, who has 24 caps, is considered to be the first-choice stopper. Premier League flops Andriy Shevchenko and Andriy Voronin were among the five forwards in the 23-man squad. Ukraine take on Austria in another friendly on June 1 before a final warm-up against Turkey on June 5. They open their Euro 2012 campaign against Sweden on June 11. England and France are also in Group D.
Goalkeepers: Andriy Pyatov (Shakhtar Donetsk), Olexandr Horyainov (FC Metalist Kharkiv), Maxym Koval (FC Dynamo Kiev). Defenders: Olexandr Kucher (Shakhtar Donetsk), Yaroslav Rakitskiy (Shakhtar Donetsk), Vyacheslav Shevchuk (Shakhtar Donetsk), Evhen Khacheridi (Dynamo Kiev), Taras Mykhalyk (Dynamo Kiev), Evhen Selin (Vorskla), Bogdan Butko (Illichivets). Midfielders: Olexandr Aliev (Dynamo Kiev), Denys Garmash (Dynamo Kiev), Oleh Gusiev (Dynamo Kiev), Andriy Yarmolenko (Dynamo Kiev), Evhen Konoplyanka (Dnipro Dnipropetrovsk), Ruslan Rotan (Dnipro), Serhiy Nazarenko (Tavriya), Anatoliy Tymoshchuk (Bayern Munich). Forwards: Artem Milevskiy (Dynamo Kiev), Andriy Shevchenko (Dynamo Kiev), Marco Devic (FC Metalist Kharkiv), Andriy Voronin (Dynamo Moscow), Evhen Seleznyov (Shakhtar Donetsk).